Here’s another great idea from Bernie Sanders, the self-declared ‘democratic Socialist’, who should definitely be the one to go to the White House next year, rather than Trump. Remember how Trump was telling everyone at his rallies that if he got into power, he was going to stop the corporations outsourcing their jobs abroad to create more poverty and unemployment in America? Aside from the racism and the islamophobia, it was this promise which may have helped him gain the votes of middle class and blue collar workers, whose jobs are threatened by the neoliberal outsourcing policies championed by the establishment Republican and Hillary Clinton and her clique in the Democrats. Now Bernie Sanders has come up with a proposal to try and keep Trump to his promise. In this piece from Secular Talk, Kyle Kulinski discusses the report in the Huffington Post that Sanders has put forward the outlines of an ‘Outsourcing Prevention Act’. If this was passed, it would punish companies moving jobs out of America. Those corporations that did so would be banned from receiving federal tax breaks, grants or loans, and demand the repayment of any federal perks. The offending companies would also have to pay a tax equal to the amount they saved through the outsourcing, or 35 per cent of their profits, whichever is the greatest amount. The executives would also be banned from receiving bonuses, stock options or golden handshakes. Kulinski makes it clear that Democrats and progressive should not be prepared to give an inch of cooperation to Trump when he trying to pass any of the massively unjust or racist measures he’s promised, such as deporting undocumented immigrants, registering Muslims and building that wall with Mexico. Kulinski recognises, however, that the latter is rapidly being played down, with Trump himself now claiming that it was mainly metaphorical. When Trump does propose something that will benefit all Americans, rather than just the corporate elite, or racist Whites, they should be prepared to work with him. This proposal is Bernie’s attempt to make sure Trump doesn’t go back on his promise, and actually does something positive for the American people. We need something similar in this country. Executive pay has massively outstripped ordinary people’s wages and salaries, and companies are outsourcing jobs abroad, including elsewhere in the EU. It has been something of a local issue here in Bristol, where the local chocolate factory, Cadbury’s in Keynsham, a small town between Bath and Bristol, was closed down after it was taken over by Kraft foods. I’ve got a feeling the company then moved the jobs to a new factory in Poland. I’m not sure how much chance Bernie’s proposal actually has of ever becoming reality. Trump is now very rapidly going back on all of his election promises, appointing Washington insiders and establishment bankers to important cabinet posts. These include some of the very people he personally attacked at his rallies. And even if it had his backing, neoliberal and corporate interests are now so entrenched in both sides of Congress that it would be bitterly attacked and voted down. And you can imagine how the Conservatives and their paymasters in the CBI would scream and holler if Jeremy Corbyn promised anything similar in the Labour party. They’d almost certainly be joined by the Blairites. After all, Tony Blair said that his administration was ‘extremely relaxed’ about becoming rich, and did so much to promote businessmen to important and lucrative government posts. And vast numbers of MPs, possibility the majority, are managing directors or senior executives of companies, and therefore stand to benefit personally from government policies that boost business at the expense of domestic jobs. We need to clean up parliament, and remove the corporate interests so that it starts to represent the British people as a whole, and not wealthy businessmen and women. And we do need to prevent further jobs being lost abroad, and punish the firms that make big profits from creating unemployment here in Britain. The I newspaper today carried the news that Tony Blair wants to return to British politics. Apparently, the former PM thinks that his reputation is ‘recoverable’. There wasn’t much more to the piece than that, the rest of the small snippet being composed of two other newspapers reactions to this news. One of them quoted Owen Jones, the author of Chavs: The Demonisation of the Working Class, who claimed that without Blair making Britain join Bush’s invasion of Iraq, the Labour party would not be led by Jeremy Corbyn today. I can see his point. Blair’s participation in an illegal war, which has turned the country into a blood bath, facilitated the rise of Daesh, and led to the deaths of so many brave men and women, simply so the multinationals and the Saudis can loot the country’s oil and other industries, is one of the major reasons why voters became increasingly disenchanted with the Labour party and its Tory leadership. But there were many other reasons besides. Basically, Blair was responsible for many of the disastrous policies that are gutting our precious health and school systems. They were expanded by Cameron, and are being carried on apace by Theresa May, but Blair was responsible for starting them. * The privatisation of the NHS, with the piecemeal dismantlement of the Health Service into ‘community care groups’, intended to be able to commission private health care companies to provide medical services; the expansion of the Private Finance Initiative, launched by the Tories’ Peter Lilley, which has burden hospitals with massive debts, all for the profit of private companies; deliberate outsourcing of medical services to private healthcare companies; and the establishment of ‘polyclinics’ or walk-in medical centres, again as private firms. Alan Milburn had the goal of reducing the NHS to a kitemark on services provided by private healthcare providers. * The launch of the disastrous academies. These were set up by Blair as City Academies, and based on an idea Norman Baker rolled out under Thatcher, but which had to be abandoned because even they realised it was rubbish. The academies are monstrously expensive, in many cases costing nearly ten times as much as the budget given to the LEA for all the schools in its catchment area. They are highly selective, and in many cases also extremely discriminatory, using mass expulsions and exclusion to get rid of difficult pupils, or students, who are less able than their fellows, in order to keep their academic ratings artificially high. Despite this, about 80 per cent of them are no better than the LEA schools against which they compete, and the excellent results of the other 20 per cent are no more than you would expect, if each individual state school received £20-£30 million in funding. * The massive expansion of corporate power into the mechanism of government, with unelected managing directors and company heads being given positions on government committees and quangos. * Massive backing for the supermarkets, despite these harming local businesses and exploiting their suppliers through highly unfair and manipulative contracts. * Continuing the Tory policy of deregulating and favouring the financial sector, with the result that all the safeguards that could have prevented the 2008 crash were removed. And that led to the current situation, where ordinary people are being pushed further into poverty, while the bankers are back enjoying massive bonuses and corporate bail-outs. * The further cutting of the benefits system, including the introduction of the Work Capability Tests, which have seen tens, perhaps hundreds of thousands of disabled people thrown off benefits, declared ‘fit for work’, and left to struggle and die in poverty. Several hundred have so far died as a direct result of being left without an income due to these tests. * Privatisation of the prison service. Blair was approached and lobbied by American private prison operators, like Wackenhut, about handing the running of British prisons over to them. * The passage of further legislation intended to weaken whatever remained of the power of trade unions. * Oh yes, and the privatisation, or at least the part-privatisation, of the Post Office. He was also responsible for the further, massive expansion of the surveillance state, secret courts and expanding the length of time prisoners can be held without charge. I realise that these policies weren’t new. Many of them, like the PFI and the City Academies, were recycled Tory ideas, as were his privatisations, including the NHS, and the welfare reforms, which were deliberately intended to cut welfare support to the unemployed and long-term sick. But Blair did not have a mandate for them, and in opposition had explicitly condemned them. And in fact, Blair 1997 election victory was such that he could have comfortably reversed them with no threat of losing votes to the Tories. But he didn’t. He carried on with the policies he’d inherited from Thatcher and Major, policies which have been in turn passed on and expanded by Cameron and May. These policies also played no small part in creating the disenfranchisement of large sections of the working class from British politics, and alienating traditional, working class Labour voters as Blair chased the votes of the middle class and rich. And these policies on their own should be enough to make people heartily sick and tired of him. Coupled with his illegal, murderous wars in the Middle East, they present an overwhelming argument against him making a comeback. Blair possibly believes that if he returns to British politics, his presence will be enough to rally the neoliberal troops in the Labour party, oust Jeremy Corbyn, and make the party ‘electable’, or rather, palatable to Britain’s corrupt, bloated and exploitative establishment again. Let’s show the vile, corporate warmonger that he’s very, very wrong. I’ve just finished translating a pamphlet I got thirty years ago from the Austrian embassy on the system of factory councils and co-determination there. Like Germany, Austria has a system where much of the work of the trade unions in individual factories is performed by factory councils, rather than shop stewards. The number of members in a council vary according to the size of the factory, and most members of these councils, as a rule, tend to be members of the trade union. These call meetings of the factory staff, and negotiate with the management about pay and conditions, as well as changes to working practices, closures and the like. There’s also a system of Youth Trust Councils, for employees, who are too young to vote for the factory councils. In joint-stock companies, the factory councils may, I think, also nominate some of the members of the supervisory councils, which may appoint up to a third of the members of the board of directors. As with Britain before Maggie started trashing such arrangements, there was also a mediator in the State Economic Commission, which would step in to make an award if no agreement could be reached between the employers and the factory council and trade unions. There was also parity commission, which was the Austrian counterpart to the British Wages and Prices Commission in the 1970s. This is not an official translation, and I’m sure I’ve made any number of real howlers. 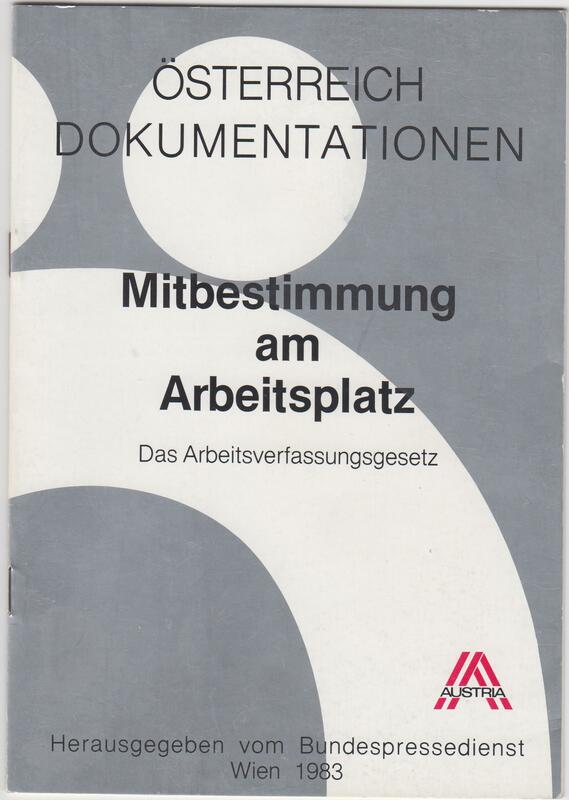 It’s also nearly thirty years old, so please don’t take it as a guide to present Austrian employment legislation. I wanted to translate it, as a way of showing one of the forms workers’ control/ management representation has taken, and which could be a model for better industrial relations over here. The Austrian parliament unanimously passed the Constitutional Law on Work on 14th December 1973, which came into power on 1st July 1974. it is one of the significant sociopolitical laws of the Second Republic, as Austria has been since 1945. With this legislation the regulation of the collective rights of the workers, which were valid up to then, were thoroughly standardised, their present scope broadened and their basic principles improved as well as their details. The law has already been in force for several years. Up to now, the experience has led to further improvements reaching their goal, especially with the recent effort to put in motion reforms of the representation of employees. Austria can thank the good cooperation of the employees’ and employers’ representatives for social peace and prosperity. Conflict is settled at the official table. It hardly ever comes to strikes. One of the most important of this good collaboration’s assumptions is a worker’s right, whose principles are respected by both sides. The employment right has a considerable tradition, it was further continually developed and finally adjusted in a comprehensive manner to the challenge of our day with the passage of the new Constitutional Law on Work. The factory constitution is regulated in the second part of the Constitutional Law on Work. It means to express here in a programmatic statement, that the declared goal of the factory constitution is to bring about an equalization of the interests of the employees and the factory. This is the guiding principle for the whole law. The legislator expresses with that, that there exists a natural opposition between the interests of the staff and those of the plant owners. Its execution should however, follow the regulated paths. The new regulations encountered offer the right instrument for that. The Constitutional Law on Work is the first part of an entire codification of Austrian employment rights. It contains the decision on collective employment rights, as well as the employees’ organisations and their relationship to the employer. The second part of the codification will include individual employment rights, as well as perhaps the decisions about working hours, holidays, days off, protection of service, and the employment of women and children. It has been realised in sections. Up to now the regulations about leave were in force, further regulations, e.g., about the termination of employment contracts and compensation security will follow. The whole codification should combine the rights of the employee in a single work of legislation. The negotiations about the Constitutional Law on Work has extended over more than a decade. It especially came to vehement arguments in the last, decisive phase between the employers’ organisations and the unions. The control of factory co-determination and employee co-operation repeatedly stood in the foreground, as it dealt here with very recent innovations opposed to the earlier legal position. Finally it succeeded in arriving at a compromise, which all those taking part could agree. The agreement reached amends to the passed legislation, that the Constitutional Law on Work finds in practice, not just according to the letter, but also in its spirit, according to application. The Constitutional Law on Work is in force for all Austrian employees with the exception of officials in public service and employees in agriculture and forestry. The collective employment rights in force in the Constitutional Law on Work cover five great areas of rights above all. * Agreements between employees and employers above factory level. * Employees’ organisation in the factory and their rights. * The role of the unions in the workplace – as far as these have been mainly regulated by law. * Agreements between employers and employees at workplace level. * The employees’ right to co-determination in the enterprise’s organs. * Co-determination in social concerns. Agreements between the organisations of the employees and employers are concluded n the form of so-called collective agreements. Such collective agreements can only be agreed according to the determination of the law between the parties capable of collective agreement. The employers’ side as well as the side of the employees automatically possess the constituted legal representation of their interests (with compulsory membership) for the capability for collective agreements. On the side of the employers this is dealt with by the Chamber of Industrial Economy (Chambers of Trade); on the employees’ side, the chambers for workers and employees. At the same time those organisations are awarded the capacity for collective agreements by the authorities on the basis of legal prescriptions, resting on voluntary membership and which, among many other things, the number of their members and the extent of their activity have decisive economic significance. In practice no collective agreements are decided by the chamber for workers and employees on the employees’ side. This function falls to the Austrian Federation of Trade Unions and its 15 unions, which possess the capacity for collective agreements for all groups of employees. On the side of the employers collective agreements are as a rule decided by the Chambers of Industrial Economy and their sub-divisions, but there are also professional associations, which were awarded the capacity for collective agreements and which themselves make use of the possibilities resulting from this. The Chamber of Industrial Economy are the corporate bodies of the public right, and represent the interests of industrial economy. All enterprises of industrial economy must belong to it on the basis of legal decisions and accordingly have to render a large membership fee. There is a federal Chamber of Industrial Economy for the whole federal area, and a chamber of industrial economy for the land in question, in each of the federal lands of Austria. As well as the Federal Chamber of Industrial Economy, the chambers in the lands are also arranged in sections: industry, business, trade, foreign commerce, finance and commerce. The functionaries of the chambers are elected by the members of the chamber in secret ballots, in which there an indirect electoral system from the smallest specialised groups at the level of the lands to the top of the federal chamber. The elections are made according to lists, which are as a rule arranged by the industrialists’ organisations of the political parties. The overwhelming majority in almost all organs of the chambers of commerce in all the federal lands is placed by that list, which is connected to the Austrian People’s Party. The Austrian Federation of Trade Unions is an organisation of employees resting on voluntary membership. It is divided into 15 specialist trade unions, which are basically organised on the principle of the individual group. This principle has only penetrated, , when apart from the trade union for the workers in private industry there is also its own union for the staff. As a rule through this only two trade unions are represented in a workplace (one for the workers and one for the staff). The Austrian Trade Union Federation is relatively centrally organised. As well as financial sovereignty, legal personality falls exclusively to the central institution. The individual trade unions are nevertheless responsible for the policy of collective agreements. The trade union federation has a comparatively high density of organisation. Out of 2.8 million employees, 1.7 million are members of trade unions. In many workplaces there is a hundred per cent organisation. Apart from the Austrian federation of trade unions any greater such unions, only similar to trade unions, exist neither in private industry or public service. Within the Austrian Federation of Trade Unions itself there are, however, political groupings (factions), in which the trade unions members may meet the individual political parties. The organs of the Trade Union Federation and the trade unions are largely constituted on the basis of the political strength of the particular parties within the trade union membership. Accordingly the top functionaries of the Austrian trade union federation and almost all the trade unions come from the Austrian Socialist Party. Laying down the area of validity of a collective agreement is basically the duty of the free agreement of the agreeing parties, which are concluded for ‘branches’, in which only one particular enterprise is active as employer, there are also general collective agreements, which comprise almost the entire Austrian economy. The collective agreements are basically valid for all employers and employees, which belong to the bodies capable of collective agreements, which have concluded an agreement. On that point the collective agreement is also valid for those employees, which do not belong to the employees’ voluntary organisations, but are employed by an employer, who belong to the concluding employers’ organisation. As the collective agreements on the employers’ side as a rule are concluded by the interested parties’ legal representatives (with compulsory membership) and almost all the professional groups are covered, it is almost not possible for an enterprise to operate in a space free of collective agreements. The present content of the collective agreement is naturally regulation of salaries. Austrian collective agreements respectively contain for everyone the minimum wage of their underlying employees’ group. This minimum wage can be changed through agreements at the level of the workplace or between the particular employee and the employer – though solely in the favour of the employee. Apart from that, in many cases agreements are concluded between the parties capable of collective agreements, that the wage paid to the individual employee at the time of the conclusion of the collective agreement – independent of its relationship to the minimum wage in the collective agreement – are raise by a certain percentage. These agreements in Austria are called wage rises, established by collective agreement. Regulations about the permissible system of performance wages and the method of their execution are often contained in the collective agreements. Apart from regulations for wages, the collective agreements as a rule also contain decisions on the type of work and welfare rights. So most certain working conditions, regulations about working hours, free time, are concluded through collective agreements. Where these matters are also regulated legally (which today is almost the case in many cases and should be developed in the frame of the second part of the codification of employment rights), the collective agreements’ regulations can only vary in favour of the the employee, however, never to their disadvantage by law. According to the Constitutional Law on Work it is also possible, that agreements about the humanisation of the workplace and agreements about the common arrangements of the parties to the collective agreements, are secured in the sense of the protection of the employee from the consequences of rationalisation. There are also agreements over price and wage policies in the frame of the very widely developed collaboration between the trade unions and the chambers of commerce in all areas of the politics of the social economy. The parity commission constitutes the institution for equalizing the interests in this sector for prices and wages. This institution, which has in no way legal anchorage, meets monthly under the chairmanship of the federal chancellor of the Austrian republic. Apart from members of the federal government the top functionaries of the employers’ and employees’ organisations take part in its conferences. The trade unions have bound themselves to raise wage demands only if the parity commission opens negotiations. If a trade union wants to carry on negotiations by this about a new collective agreement, it must carry this wish above the Austrian federation of trade unions to the parity commission, that means, to the competent wages committee for it. There will commonly be consultations between chambers and the trade union federation, whether new negotiations should be permitted on the grounds of the terms of the collective agreement and the general economic situation. The judgments of this system must nevertheless be clear, that the decision of the parity commission is practically never refused; the influence of the commission in practice merely extends, to that it can delay the point in time of the wage negotiations. The most important employees’ organ in the workplace is the factory council. A factory council can be elected by the employees in every workplace, in which at least five people are employed. When at least five workers and five staff are employed at the same time, so in almost all cases separate factory councils for the workers and the staff are elected. There is, however, also the possibility, under certain conditions, of electing common factory council in such factories. Where there exist separate factory councils for workers and staff, these commonly form the factory council. In such councils a worker can be elected in the staff factory council, and a member of staff in the workers’ factory council. The number of members in the factory council is set down by law. For five up to nine employees, a single member of the factory council is to be elected; from ten to 19, it is two, from twenty to 50, three members of the factory council, from 51 up to a hundred, four factory council members, and so on. In factories with 500 employees there are eight, with a thousand, thirteen, and with 5,000 employees 22 factory council members. The factory councils are elected in a written and secret ballot of all employees of a factory for a duration of service of three years. Basically the system of proportional representation is used; in the smallest workplaces voting takes place solely for persons. To tender a candidate list for the factory council elections – varying according to the size of the factory – a number of signatures of those entitled to vote is required. In practice standing as a candidate is either through a list of names or lists ov candidates, who declare themselves for a particular political part. Lists drawn up by the trade unions are not usual. Foreign employees (of which at the moment about seven per cent of the employees active in Austria are foreign citizens) possess a fully active right to vote in elections to the factory council. There have no right to a passive right to vote. As workers in the sense of the Constitutional Law on Work, employees belonging to middle management are also valid. Only managing and work directors of a factory and executive employees with similar wide-ranging powers do not fall under the conception of a worker and are from this neither active nor passive in the frame of the entitlement to vote in the employees’ organisation. The execution of elections to the factory council is a duty of the electoral board, which is to be elected in a factory meeting. The factory council is also duty bound to render accounts of its activity regularly to the workforce in the frame of factory meetings (at least once a half-year). It can be recalled by the factory meeting with a qualified majority under certain conditions. All employees (i.e., the workers or staff) of the factory concerned take part in the factory meeting. The factory meeting can also be held during working time, if the factory owner is agreeable to this. It can be agreed in collective negotiations or at the factory level, that salaries will be fully paid for the time of the factory meeting; this is the rule in the most cases. If an enterprise consists of several factories, a central factory council is to be established. The central factory council is elected on the basis of proportional representation by all the factory councils of the respective enterprise from their midst. It represents the whole staff opposed to the enterprise management in all questions, which go beyond the sphere of action of a particular factory. It reports to a meeting of factory councils, to which all the factory councils of a particular company belong. The employer is bound to place at the disposal of the factory council space and working material, which it needs to exercise its activity. It is usual in Austria, for the factory councils to have in middle, and in many cases, also in small enterprises to have at their disposal at least its own room and corresponding office materials. In larger factories it falls to the share of the factory councils to have a clerk, whose cost is born by the enterprise. The factory councils also have at their further disposal financial means in the form of factory council funds. These funds are fed by a distribution of cost, the height of which is established by the factory meeting. It can amount to half a percent of the salary, that means, of the pay, and is deducted by the employer from the salary’s payment and transferred to the factory council. Apart from the organisation’s cost, social contributions are also paid from these funds. The employer has to grant the members of the factory council the free time necessary, with the further payment of their wages, for the fulfillment of their duties. At the offer of the factory council, in factories with more than a hundred and fifty workers, one, in factories with more than seven hundred workers, two, and in factories with more than three thousand employees three members of the factory council (for the further three thousand employees yet another member of the factory council is elected) are to be exempted from the stoppage of wages for their capacity to work. The law prescribes, that these exempted members of the factory councils, who fully dedicate themselves to representing the interests of their colleagues, are in no way allowed to accrue to themselves disadvantages in pay or promotion. Every member of the factory council is entitled to an exemption from work to take part in training and educational events, up to a maximum of two weeks in their three year term. In factories with more than twenty workers during this period the full wage is to be paid. In factories with more than two hundred employees a member of the factory council on the factory council’s application is exempt during the term of the factory council for a maximum period of up to a year in order to take part in training and education events – at any rate, without stoppage of pay. These decisions serve to give the members of the factory council the opportunity to acquire those perceptions, that they require for the better exercise of their functions. This stands to them as a rich offer to have at their disposal the employees’ organisation’s educational event. The members of the factory council choose from their midst a factory council chairman. The members of the central factory council elect the central factory council chairman. The factory council chairman represents the factory council to those outside and convenes its sessions at least once a month. In the larger factories the factory council chairman is, as a rule, identical to the exempted members of the factory council. Apart from its common powers of representing the staff, the factory council is entitled to precisely defined rights in social, staff, and economic questions. It has as part of its usual powers, the right to supervise compliance with legal prescriptions and collective agreements in the factory. For this goal the factory council is granted the right to inspect payrolls and lists of salaries. If staff actions are conducted in a factory, the factory council can take judgment through an agreement of the employees for the actions of the staff. The factory council has the right, in all matters, which affect the interests of the workers, to propose appropriate measures to the factory owners or his competent co-worker and, if need be, the responsible agencies outside the factory. The factory owner is obliged to listen to the demands of the factory council, in all matters, which concern the interests of the factory’s employees. The factory owner is further obliged to give information on all matters, which affect the economic, social, health or cultural interests of the factory’s employees. He has to hold common conferences with the factory council at least quarterly about current matters, general principles of factory management in social, staff, economic and technical respects as well as about the shape of working relations and inform it of important matters with that. Such conferences are carried out monthly at the demand of the factory council. The factory council also has the right to arrange and administer supporting arrangements for the benefit of the workers and those belonging to their families, as well as other welfare institutions. In the larger factories in many cases there exist such support funds from the factory council; in some cases these are paid in by contributions by the enterprise to these supporting arrangements based on agreements at the factory. The factory council is further entitled to co-operate in the planning and execution of the factory’s vocational training as well as educational and retraining measures. It has the right to take part in the administration of the factory’s and enterprise’s own training and educational arrangements, as well as the administration of the factory’s and enterprise’s own welfare arrangements.